This class can authorize the access of users to an API using the OAuth protocol. It abstracts OAuth1 (1.0 and 1.0a) and OAuth2 in the same class, so you can use the same code to authorize the access on behalf of the current user any API that supports any version of the OAuth protocol. It works on Linux, Windows and any other platform without the PECL PHP OAuth extension. The access tokens are stored by default in session variables, but there are sub-classes specialized in storing the tokens in database tables, files or cookies. It provides built-in support to several popular OAuth servers, so you do not have to configure the class manually with all OAuth server specific details. Currently it provides built-in support for many OAuth servers. Every other OAuth server is supported setting end point URLs and other parameters using specific class variables. Additional servers may be supported without changing the main class by configuring a separate JSON configuration file. The class can also send requests to API using the previously obtained OAuth access token. It also supports 2 legged API access, so it can send signed API requests that do not require user authorization. For mobile or other applications that the user cannot be redirected back to the client application site, this class supports pin based authorization either using OAuth 1.0a or OAuth 2.0. It can as well obtain access tokens for specific users given their user name and password or using client credentials. It supports OAuth 2.0 authorization flows authorization_code, password and client_credentials. For servers that support offline access like Google and Box.net, the class can also verify if the access token expired and refresh the token value before sending an API call, without requiring the user presence. For servers that support re-authentication like Facebook, the class may also force the user to enter this application password on the authorization page. For servers that support revoking access tokens, the class supports this functionality to invalidate a previously retrieved token. For OpenID Connect servers based on OAuth2, the class decoded and returns the id_token JSON Web Token (JWT), so applications can use the user details such as name and email returned in the id_token response. The OAuth protocol is not hard to understand but it requires learning about many details and the many differences of operation with different OAuth servers. PHP has an extension for using OAuth but it practically requires that you learn all the specification documents for all aspects of the OAuth protocol. Therefore it is better to use a client class like this encapsulate all steps so you do not have to learn so much about the OAuth protocol in all its versions. This PHP class can work with OAuth 1.0 and 1.0a. Despite the class supports servers that work with OAuth 1.0, it is not a secure solution. So most servers that you see and support OAuth 1.0, it is actually OAuth 1.0a which is secure. OAuth 2.0 is not a better version of OAuth 1.0a as if it was an upgrade. You may still see many servers that work securely using OAuth 1.0a. Nowadays most servers use OAuth 2.0 because it is a protocol version that support more extensions. The PHP OAuth class either OAuth 1.0, OAuth 1.0a and OAuth 2.0 . For the developer that uses this class, it does not make much difference because the function calls to use are the same. The main internal difference is that OAuth 1.0a servers return both an access token value and an access token secret. Several articles have been written to tell not only how to use this package but also to tell about how the different versions of the OAuth protocol work. You can read all the available tutorial articles in the package blog. The main tutorial article is entitled PHP OAuth Tutorial on How to Use a Pure PHP OAuth Class with an Example Without using the PECL module Implementation. This PHP OAuth class can work with any server using OAuth1 or OAuth2. Just change the server variable to the name supported API. The class provides built-in support for a few common APIs but any new API can be supported by adding a new entry to the oauth_configuration.json file. Here is a simple example of getting the authorization token and making an API call to Facebook Graph API. 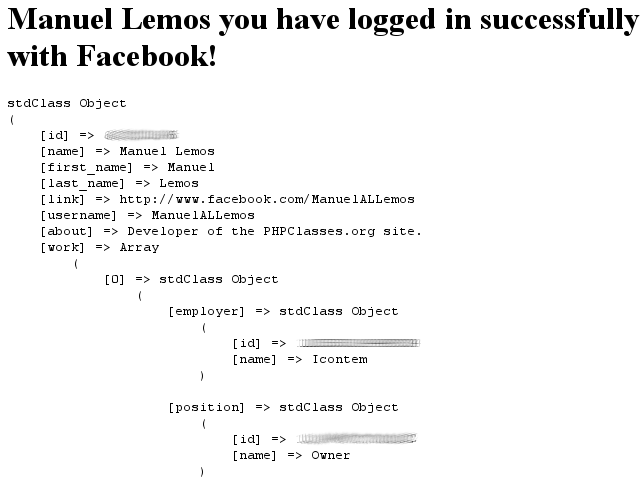 Check the complete Facebook OAuth2 PHP OAuth example here. // vendor/autoload.php if you used composer to install the package. Here is a simple example of getting the authorization token and making an API call to Vimeo API. Check the complete Vimeo API PHP example here. This example retrieves the Google user contacts using the People API. Check the complete Google Contacts API PHP example here. This example retrieves the Pinterest user details using the Pinterst API. Check the complete Pinterest API PHP example here. What is the best PHP facebook login class? What is the best PHP youtube api class? What is the best PHP hotelbeds api class? What is the best PHP php7 oauth http client class? What is the best PHP zurmo api class? How to login with Facebook? What is the best PHP flickr uploading class? What is the best PHP oauth class? What is the best PHP twitter auto post class?